As the shortcomings of purely synthetic approaches to biochemical discovery and development are becoming more apparent, a renaissance of interest in the chemistry of natural products as sources for new compounds is occurring. 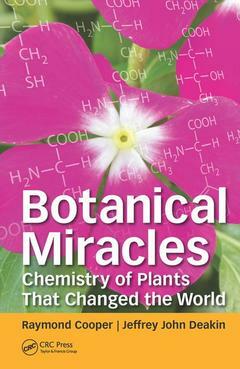 A unique approach to natural products chemistry, Botanical Miracles: Chemistry of Plants That Changed the World relates applications of plant extracts to the historical progress of civilization. It focuses on selected plants from around the world, connecting their stories and properties to the development of modern marvels such as medicinal compounds, nutrition products, beverages, perfumes and organic pigments. Each chapter describes a particular group of plant extracts from various perspectives, including their chemistry, interest and value to man and historical background. The ends of the chapters pose challenging questions. Introducing plants that are emerging into more prominent roles in human life and addressing current challenges, Botanical Miracles presents a fascinating point of entry to the chemistry of important natural products. It examines plants and their extracts through the key functional groups, building blocks and concepts of organic chemistry. This book provides, in a single source, information and learning opportunities of value to a wide range of individuals involved in the fields of chemistry, medicine, nutrition or cosmetics whether they be students, educators, researchers or those who simply wish to extend their horizons.
. Central America’s Humble Potato!
. Tea: From Legend to Healthy Obsession!
. Coffee: Wake Up and Smell the Aroma! This book is intended for graduates and undergraduates in chemistry and pharmacognosy. It also would be useful to researchers in anthropology, biology, pharmacy and ethnobotany as well as to chemists interested in the history and development of medicines.